At the Lanes Group nothing is more important than the health, safety and welfare of our people and our customers. It’s a major reason we are the UK’s largest independent specialist drainage contractor, with a turnover in excess of £150 million, over 1900 people and a country wide network of branches. We operate 24/7 and as such you are required to work flexible hours, weekends and participate in an on call rota. Full training/PPE/use of company equipment will be provided to ensure that all our Service Engineers have the right tools, competency and confidence to undertake the work to Lanes’ high standard of operation regardless of background or previous experience. Benefits: 20 days holiday including bank holidays; health cash plan; free onsite parking; auto enrolment pension scheme; friendly working environment. Due to continued growth and development, we are now looking for customer focused people to join us in our Utility Division, working on our Thames Water contract service to deliver real and effective solutions to waste-water network and drainage problems. So if you enjoy delivering only the best in customer service, where no two days are the same and want to join a growing company that not only values you and your ability - but also strives to develop your potential and further your career progression, then we are the right Company for you. What is absolutely essential is the ability to work safely to quickly diagnose and deliver practical and efficient solutions to attain the highest levels of customer satisfaction. 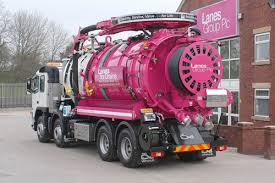 The ideal candidate will have experience in the driving of HGV Class II vehicles however drainage experience is not essential as training can be provided. This is the chance to embark on an exciting new career whilst earning an attractive salary. You must have a minimum of a HGV Class 2 licence and you must have completed the certificate of professional competence (CPC) and an upto date digi tachograph card. To be suitable for this role you will require transport to commute to and from your place of work. We are an equal opportunities employer and welcome applications from under-represented areas of the community.